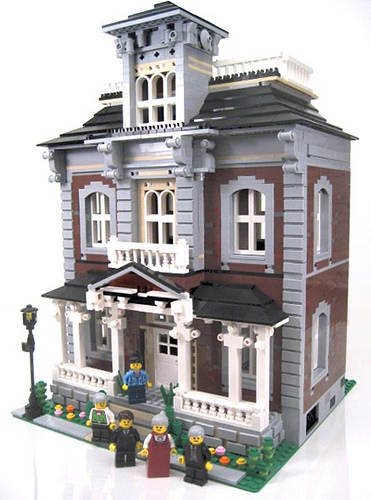 The latest 10182 Café Corner building from L.G. Orlando (lgorlando) arrives just as the set that inspired it all begins to come and go, hearkening the end of the set’s availability. L.G.’s brickwork under the porch is excellent, and little details like the round 1×1 plates in the window frames break up the plane of the wall. It’s been nearly two and a half years since LEGO released Café Corner, inspiring thousands of LEGO builders to try LEGO Town creations — many of us for the first time. Though we all know that LEGO sets aren’t available indefinitely, it’s hard to imagine this inspirational set being gone forever. See more photos of L.G.’s Brickstone Manor on MOCpages. Wonderful brickwork there. The only thing that bugs me is the not-quite-connecting curved windows near the top. You can still get Cafe Corner for $0.02 off at Amazon.com, though: it’s where I got mine in my panic to grab a copy before it was gone. The end of the cc?